A range of ‘open’ philosophies and models have emerged during the 20th century as a result of several different drivers and motivations – including sharing freely, preventing duplication, avoiding restrictive copyright practices, promoting economic efficiencies and improving access to broad groups of stakeholders. Many of these developments have been driven by and created by communities that recognise the benefits to themselves, and sometimes to wider groups. Some of these are Open Source Software, Open Standards, Open Access to Research Results, Open Design, Open Data, Open Courseware. Several of these movements have somehow influenced the education community both in terms of research on learning and teaching (particularly in the area of educational technology). Whilst it is widely expected that sharing and openness would bring benefits to some stakeholders in the all the above areas, traditional cultures and practices, managerial approaches and processes, and perceived legal complexities have been identified as barriers to sharing both within and across institutions (See for example http://repository.jisc.ac.uk/265/1/goodintentionspublic.pdf). The Open Education movement started around the concept of Open Educational Resources (OER), a term originally coined at a forum arranged in 2002 by UNESCO (see more on OER in Module 3). In response to the growing interest in the subject, the OpenCourseWare Consortium (recently renamed as Open Education Consortium) was launched in 2005. Before that, the Massachusetts Institute of Technology (MIT) had launched the OpenCourseWare initiative (OCW) in 2001, the same year that Wikipedia was established. While MIT-OCW was preceded by similar initiatives such as Rice University’s Connexions (1999) and David Wiley’s Open Content Project (1998), it gained unprecedented attention from the media and other universities interested in replicating the model. Numerous individuals, educational institutions and other organisations around the globe have since then contributed to the so-called Open Education movement. Other relevant initiatives were launched soon after that, such as the UK Open University’s OpenLearn in 2006; and The Cape Town Open Education Declaration, resulting from a meeting of advocates in late 2007, helped to articulate the principles underpinning this emerging movement. In 2008 Dave Cormier coined the term Massive Open Online Course (MOOC) in response to an experience developed that same year by George Siemens and Stephen Downes, who ran a course on connectivism with a group of students at Manitoba University (Canada) and an extended cohort of more than 2,000 participants from the general public who were invited to follow and participate in the course for free. Over the next few years, similar MOOC experiences were developed at other institutions. In 2011 Sebastian Thrun and Peter Norvig ran another course on Artificial Intelligence at Stanford that involved more than 100,000 students. Inspired by this, a number of platforms developed by companies in partnership with, or belonging to, universities emerged over the following months (for example, Udacity, Coursera, edX). 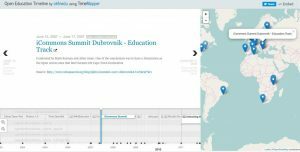 The Open Knowledge Foundation Open Education Working Group created the Open Education Timeline, a detailed listing of the most important events and milestones. What is the status of Open Education today? The Open Education movement is in good health: the Open Education Consortium is a global network working in the area, which organises the Open Education Week every year in March. 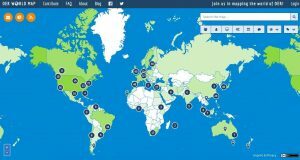 UNESCO and the Commonwealth of Learning are still pushing for openness adoption at different levels (in 2017 the second OER World Congress took place). In 2013 the European Commission issued a Communication called Opening Up Education, that has given birth to a few national initiatives such as Opening Up Slovenia. Furthermore open education, OER and MOOCs have been a central theme for almost every e-learning conference in the recent years, and a number of reports are continuously being produced looking at different OER and OEP developments, as witnessed by the richness of the www.oerworldmap.org site.